Electric knives are terrific tools for cooks of all skill levels. Whether you start with a small, curved cordless blade or a corded meat carving knife, once you own an electric knife you will find many ways to put it to work. Looking for quick advice on the best pick? For a balance between affordability and function, we think that the Hamilton Beach Carve ‘n Set Electric Knife is a great entry-level knife that won’t break the bank and will make carving and slicing as easy as pie. Using an electric knife can save you time in the kitchen, as well as doing the power work for you, leaving you the energy to put into other cooking tasks. In this guide, you will learn how to choose the best electric knife for you and your kitchen through our electric knife reviews and model comparisons. Why Buy An Electric Knife? An electric knife is a combination of two serrated blades in one handle. These blades move beside one another to make clean, even cuts in meats and bread. While electric knives won’t do all the same jobs as a high-quality all-rounder like a chef’s knife, they do have their place in the kitchen; they are great for people that struggle with difficult, repetitive carving and slicing jobs. Once you’re done carving, eject the two blades from the knife handle and separate them for washing. Electric knives are ideal tools for cutting into a large roast, ham, baked chicken or roasted turkey. They’re also very useful for slicing warm, homemade bread. Because the blades are always moving, you’re more likely to cleanly slice (instead of tear) whatever you’re cutting. While a manual knife will (eventually) make clean cuts to a large piece of cooked meat, you may wind up shredding the food and ruining the presentation. Additionally, if you enjoy thinly sliced deli meat, an electric knife is a great way to cut around the bone and get great sandwich meat. Finally, homemade breads of all sorts are less likely to crumble when sliced cleanly. Fans of gluten-free bread will really appreciate this feature! Advances in electric motors continue to make gadgets like this more than just a fancy toy. The Oster Accentuate electric knife manages to be below the price point of many non-powered knives while giving you the additional electric power to carve meats and slice bread. It’s not going to replace your chef’s knife for dicing vegetables or chopping herbs, but it’s a great tool for any home chef who often finds themselves sawing through large food items often. Unlike the Waring below, the FPSTEK2802 is a fairly basic model. It doesn’t have cord-free operation and only comes with one blade. While this means you can’t romp around the house with it, it does keep things simple. You never have to worry about the internal battery running dry and there’s one less part for you to keep track of. The knife itself does exactly what you’d expect. It can slice through turkey, pork shoulders, brisket, and any homemade bread you happen to find in your kitchen. You could break it out to trim steaks and other smaller pieces of meat as well. Beyond that, you might have trouble justifying its use over a traditional knife. This Oster knife comes with a carving fork and basic storage case. If you’re after a tool to help you carve big pieces of meat or slice bread, the Oster FPSTEK2802 electric knife may be a great choice, as long as you don’t mind the cord. As far as we can tell, the Waring WEK200 is very similar to the Cuisinart CEK120. While the Oster above is a basic corded model, this cordless Waring unit gives you more options and more flexibility. It’s powered by a rechargeable lithium battery and comes with a handy charger and heavy-duty storage/carry case. Unlike many gadgets, you’ll have to unplug the charger before you use the knife. 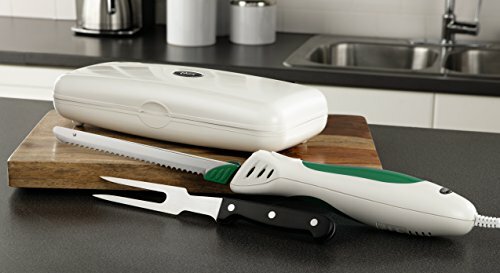 This knife comes with two blades, one for use with bread and one for use with meats, cheese, and tomatoes. It’s quick and easy to switch out the blades, making cleaning simple. There’s a cutting guide included that can be adjusted to help you cut even slices without any other tools. Finally, there’s a built-in LED on the front of the knife. It’s not going to be your primary source of illumination, but it does help when you’re barbecuing outdoors (the knife is cordless so you might do this a lot) or just carving things in a darker spot in your kitchen. 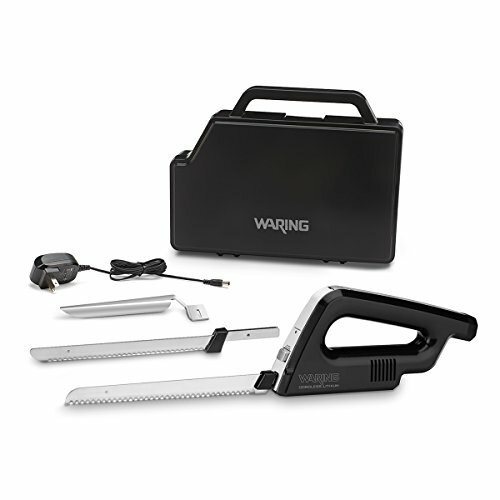 If you think you’re going to be using your electric knife a lot, or require a serrated blade, the features offered by the Waring WEK 200 electric knife might very well be worth it.​ It packs quite a lot of power and is more of a heavy-duty model for those tougher kitchen tasks. The only thing that may be off putting for some buyers is the high price tag on this model, but if you think you’ll get a lot of use out of it, it’s a quality knife that is well worth the expense. The Cuisinart CEK-40 Electric Knife is a helpful tool for carving or cutting jobs because it will make quick work of any task you throw at it. This product has a pressure-activated on/off trigger control and an ergonomic handle appropriate for either right-handed or left-handed users. Another good feature is the safety button, which will keep the knife locked when it is not being used. Like the Waring reviewed above, this unit comes with both bread and carving blades. However, while the Waring packs away into a storage case which doubles as a carry case, the Cuisinart is displayed on a hardwood block storage tray. This model is a lot more affordable than the Waring, but as a result, is a bit lower quality. The internal gears are made of plastic that may have a tendency to stop working if the knife feels overworked. This knife may fall short on certain tasks – such as cutting through larger pieces of meat – due to lack of real power. This is a fine knife that will do well for cutting jobs that doesn’t require too much power. It should keep the average home chef happy without breaking the bank, but for more rigorous tasks, can’t compare to a good quality, manual chef’s knife. The Hamilton Beach 74250 is helpful if you want to cut professional-looking slices from roasts or bread. One nice feature of this knife is its dual serrated blade, which can efficiently do the work of cutting for you. Another benefit of this set is the compact storage case where you can store the motor, knife and included fork all in one place. 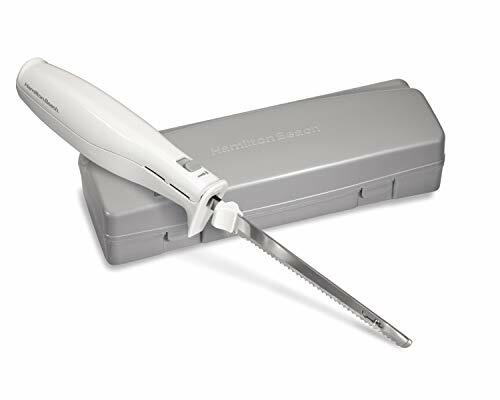 If you are looking for an electric knife that is easy to disassemble and clean, the Hamilton Beach 74250 might be a good place to start your search. One of the downfalls of the knife is that there isn’t a lock on the trigger, which could make your hand tired if you are cutting through a lot of food. Another issue you might have with the Hamilton Beach 74250 is the size of the handle, because it could make it awkward to hold. Overall, this is a good, entry-level knife at a bargain price which does a fine job at carving up a turkey or slicing finely through a fresh loaf of bread. This NutriChef model is a corded unit that features two blades – one for finer slicing jobs and one for tougher kitchen tasks. Both blades are nice and sharp and will serve you well. What sets the NutriChef apart from our other models reviewed here is its unique handle design. Rather than holding on to the main body of the knife, there is a smaller, curved, ergonomic handle above the main casing. This handle is much more comfortable than many other models, particularly for those with smaller hands or problems with arthritis. The knife itself is also nice and lightweight. Blades are easy to remove, and the entire housing is stain-resistant, so keeping everything clean and hygienic is a breeze. The major downside of this electric knife is the annoying power button control, which doesn’t feel natural. It can be difficult to operate, as you have to simultaneously press under the handle while firmly pressing a small button with your thumb on top. Overall, this is another affordable electric knife that should suit most kitchen needs. It’s particularly beneficial for users with delicate hands and should be considered a good addition to any kitchen. Electric knives are like many other kitchen tools; once you have one, you’ll wonder how you ever cooked without it. From preparing and slicing your own deli meats to enjoying fresh slices of homemade bread, electric knives make many tasks, faster, tidier and more enjoyable. Electric knives need not stay in the kitchen. Fans of Styrofoam crafts and upholstery projects will find electric knives to be an ideal tool. 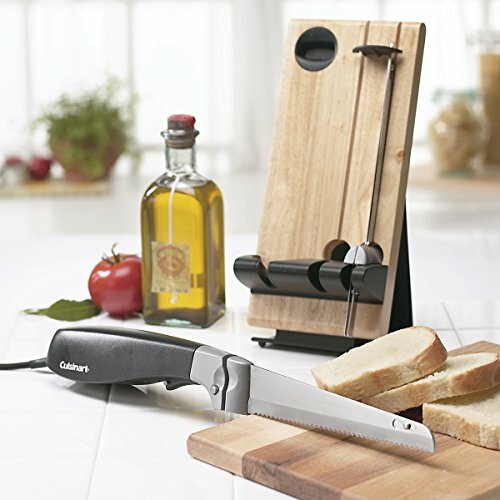 If you want to give an electric knife a shot in your kitchen, consider the Hamilton Beach Carve ‘n Set Electric Knife. 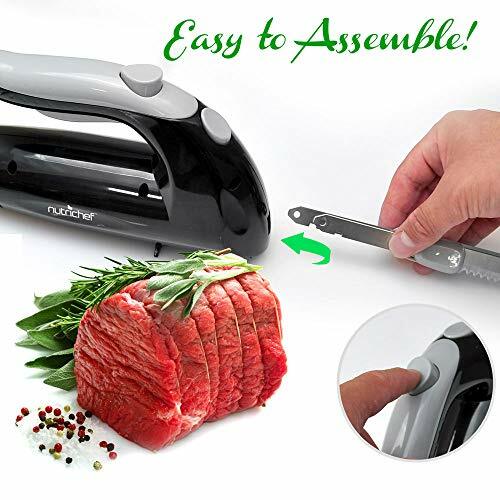 Its dual serrated blade makes short work of a ham or turkey, and the whole unit is low maintenance and easy care. I have owned a number of electric knives of all different brands. The current crop on the market now all use a steel worm gear that meshes with a nylon spur gear that drives the blades. The nylon gear, in each case, soon fails. No matter how much they cost, they all are engineered this way, and they all fail. It seems some manufacturer would note this and put some good gears in the units. They would corner the market!